Todolwen: And It Happened Again ..
on a cooler day last week there was suddenly a thud at our dining room window and my daughter Caylagh called out to me, saying that a bird hat hit it and she thinks it might have died. We went outside and right away I found the little creature, laying on the rocks right under the window. 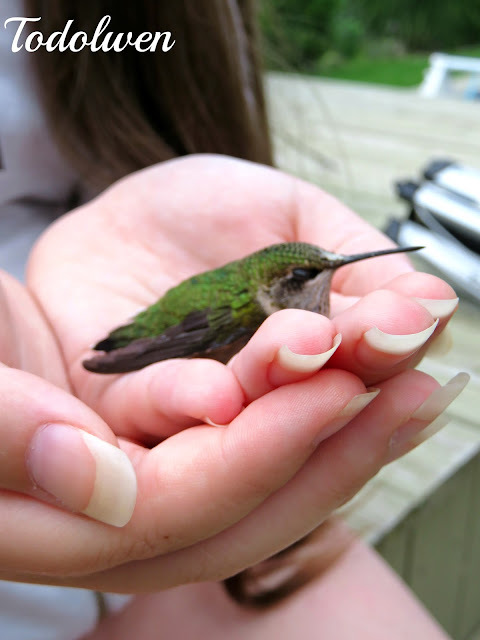 It was a tiny humming bird that hat flown into the glass. I picked it up very carefully and placed it into my daughters hands, hoping it wasn't too badly hurt. The tiny feathered critter hat knocked itself quite hard and stayed still in my daughter's palms for almost ten minutes, resting and recovering. ... but after it had calmed down a little it slowly opened them again. And then suddenly it just flew up into the air. It stopped and seemed to stand still for a split moment in mid air ... right in front of our faces. 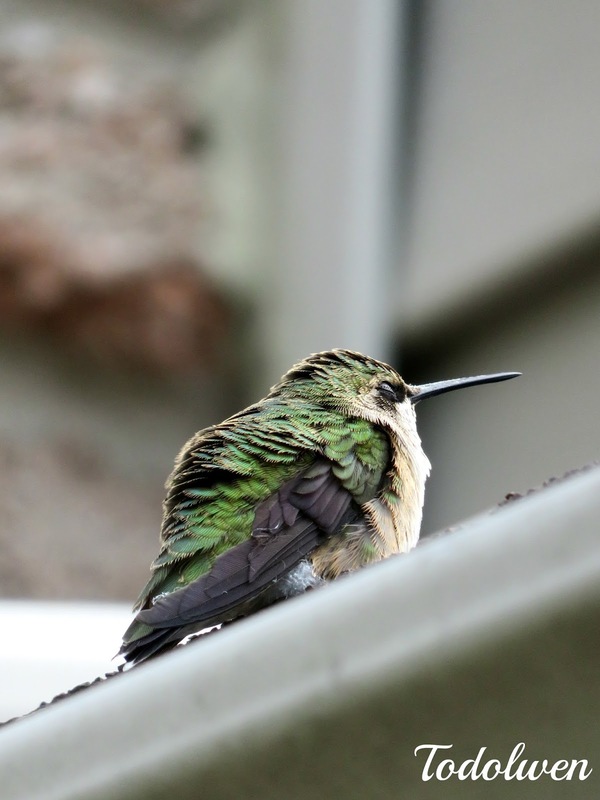 It looked at us and then flew off onto our roof where it stayed for a little while, taking in the warmth of the sun rays before flying away again. 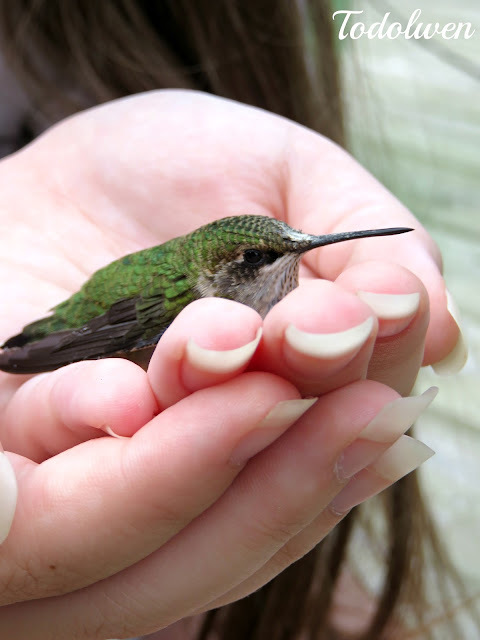 I am grateful that everything turned out to be OK with this little hummingbird and my daughter was very happy with the fact that she actually was able to help and hold this tiny creature in the palms of her hands ~ something I think, that she will remember for a long time. What a special experience! They are such sweet little creatures. And it's always such a relief when they fly away. We have very large windows near our bird seed and they hit them. We have to be quick to the rescue because our cats have learned to recognize the sound. Thank you for sharing your lovely photos and happy story! Such a delicate little bird - he/she was so lucky Caylagh heard the thump and you could rescue him. When he stepped in mid air, I think he was saying thankyou to you both! The colouring of his feathers is exquisite. I hope all is well at Todolwen Karen. It just knew how compassionate you and your daughter are.... glad you were there to assist. I'm sorry that happened to the little hummer, but what a wonderful experience for you and your daughter. So glad that there was a happy ending. I think hummingbirds are the most beautiful and unique birds. I watch them at the feeder outside my window, and am always amazed at their antics. I so happy you and your daughter were able to save this one, and I'm sure it hovered there in appreciation! A lifelong memory was made that day for you both, how wonderful. "There's a hummingbird at the trumpet vine by the whitewashed fence that I call mine... a beautiful gem in a diadem, lovely hummingbird". Such a beautiful and moving story. It will be a precious memory for the two of you. You and your daughter ... hearts of gold.